In Senate testimony earlier this year, Stanford economist Mark Duggan claimed that Social Security Disability Insurance (SSDI) was an “important factor” in the decline in labor force participation in the United States relative to other industrialized countries. In an earlier blog post, I showed that even research cited by Duggan found that disability receipt had a negligible impact on overall employment. Is it still possible that SSDI has a noticeable impact on labor force participation, a measure that includes unemployed workers actively looking for work? It might, if you believe—as Duggan does—that the process of applying for benefits is enough to make people stop looking for work. But as will be detailed in this blog post, there are more likely explanations for the relative decline in labor force participation in the United States compared to Europe, including more supportive labor market policies in Europe. Research that considers multiple causes for recent declines in participation in the United States generally finds that an aging workforce and unemployment—especially long-term unemployment—have been the main drivers (see, for example, research from the Council of Economic Advisors and Harvard University). The question is whether SSDI caused some unemployed workers to exit the labor force, or whether they would have exited regardless. 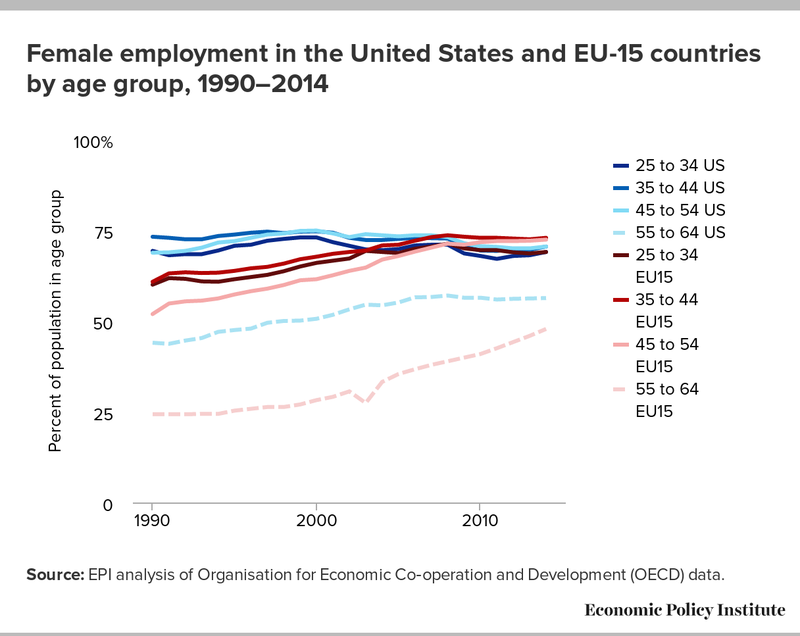 Looking at longer-term trends, the biggest difference between the United States and the EU-15 has been an increase in female employment and labor force participation in Europe, in which the adoption of family-friendly labor policies likely played a role. 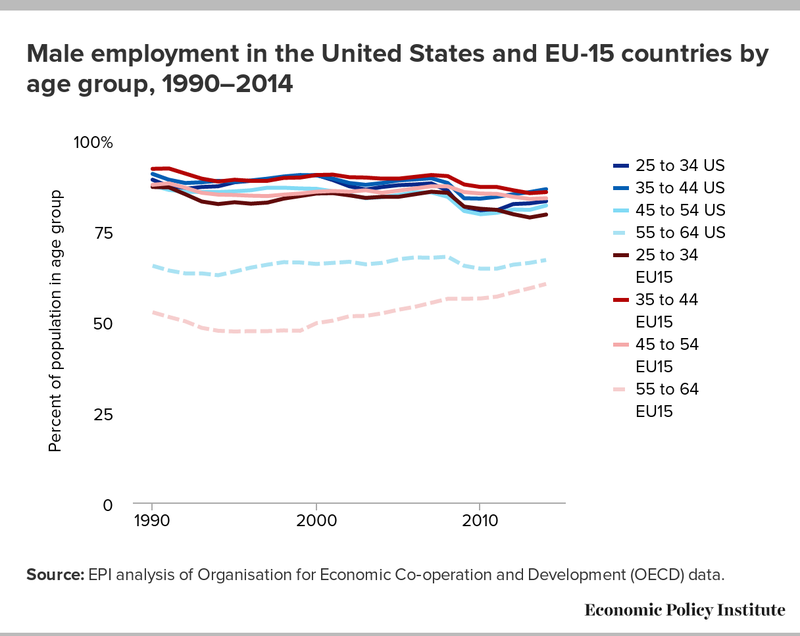 Prime-age employment rates in Europe are now similar to the United States (solid lines in the figures below) though they remain lower for older workers (dashed lines). Source: EPI analysis of Organisation for Economic Co‑operation and Development (OECD) data. Though employment rates are similar, participation rates are now higher in Europe for prime-age workers. Almost all the difference (4.2 out of 4.7 percentage points in 2014) reflects higher unemployment in the EU-15 rather than higher employment. Because people receiving unemployment benefits are required to look for work, a contributing factor is likely to be better UI coverage in the EU-15 countries than in the United States, where many people who are out of work don’t qualify for unemployment benefits. It might seem that any increase in disability rolls, even if due to an aging workforce, automatically reduces labor force participation, since disabled workers who aren’t working or actively looking for work are by definition outside the labor force. Even if true, this wouldn’t be sufficient reason to reform the program. But this assumes disabled beneficiaries aren’t working or actively looking for work (a few are) and—more importantly—that they would be working or actively looking if they weren’t receiving benefits (most wouldn’t be). As discussed in a previous blog post, a closer look at research by economists Nicole Maestas and Kathleen Mullen of the RAND Corporation and Alexander Strand of the Social Security Administration suggests that 2.3 percent of new beneficiaries would be earning a living above the “substantial gainful activity” threshold two years later if they had been denied benefits. If these beneficiaries were working, would this have a measurable effect on prime-age labor force participation? It seems unlikely. For the sake of argument, consider the somewhat larger share (3.5 percent) of new beneficiaries who would earn any amount above $1,000 per year if they weren’t receiving benefits, and assume all would remain in the labor force. In addition, assume they live twice as long as the average beneficiary, making up 7 percent of the current beneficiary population. Multiplying 7 percent by the roughly 3 percent of the prime-age population who are receiving disability benefits, the potential increase in participation is roughly 0.2 percentage points, which is indistinguishable from statistical noise in labor force statistics. Maestas et al. only consider marginal applicants who might be accepted or denied by different examiners. Disability benefits could also have a small effect on the employment and earnings of recipients who would have been accepted regardless of examiner, though the authors themselves describe any such effect as “statistically indistinguishable from zero.” Instead, Duggan suggests that the impact of SSDI on labor force participation may be larger than the small effect of benefit receipt on employment if the process of applying for benefits causes unemployed workers to drop out of the labor force whether or not they are ultimately approved for benefits. Does it matter if people apply for disability benefits instead of remaining unemployed? (Either way, they’re out of work.) It might, if disability applicants are more likely to exit the workforce permanently and receive more generous government benefits. Though many unemployed workers also receive government benefits, disabled beneficiaries become eligible for Medicare two years after being approved for SSDI, which Duggan cites as a big financial incentive to apply for disability benefits. In his testimony and elsewhere, Duggan claims SSDI “is to some extent serving as a form of long-term unemployment insurance for some workers.” However, economists Andreas Mueller of Columbia University, Jesse Rothstein of the University of California, Berkeley, and Till von Wachter of the University of California, Los Angeles compared the experiences of different states during the Great Recession and found no evidence that people applied for disability benefits when unemployment benefits ran out. This doesn’t rule out the possibility that the SSDI application process is causing some unemployed workers to permanently exit the labor force, though there is no hard evidence of this. In a 2003 paper, Duggan and Massachusetts Institute of Technology economist David Autor estimated that SSDI caused a 0.5 percentage point decline in unemployment in the United States between 1984 and 1998. Over this period, unemployment trended downward in the United States while trending upward in Europe. As discussed in an earlier blog post, during the early part of this period, age-adjusted disability incidence also increased rapidly in the United States, rebounding after a Reagan-era retrenchment. But more recent trends don’t provide obvious support for the idea that SSDI has caused unemployed workers to exit the labor force. Prime-age unemployment increased more in the United States than in Europe in the last two recessions. Though unemployment in the United States declined faster after the Great Recession, disability incidence declined as well. Other factors may obscure a causal link between SSDI and unemployment or labor force participation, which is tricky to prove or disprove because the direction of causality may go either way and because other factors, such as age composition and cyclical fluctuations in labor demand, affect both disability receipt and unemployment. In their 2003 paper, Autor and Duggan attempt to isolate the effect of SSDI on labor force participation using what’s known as an instrumental variable approach. They found that states with more low-wage workers in 1978—and therefore higher potential disability replacement rates due to Social Security’s progressive benefit formula—saw larger increases (or smaller declines) in disability rolls, and larger declines (or smaller increases) in labor force participation for high-school dropouts between 1978 and 1998 than states with lower replacement rates. However, the technique used by Autor and Duggan relied on the assumption that potential replacement rates in 1978 measured workers’ incentive to apply for disability benefits without being correlated with other factors that affected disability and labor force participation trends. Though Autor and Duggan focus on changes within states to account for unobserved differences between them, it’s likely that states with more low-wage workers in 1978 were also more affected by other factors that contributed to worsening health and declining job prospects for high-school dropouts, including growing health disparities, rising educational attainment, and an aging population (Autor and Duggan only partly control for age). With the benefit of hindsight, what is striking about Autor and Duggan’s 2003 paper is how many factors they didn’t consider, let alone rule out, including the rising share of women insured for benefits. In a later (2006) paper, Autor and Duggan do consider the share of women who are insured, but make no attempt to isolate the causal effect of SSDI receipt on unemployment or participation. Thus, it’s not clear whether Duggan has any basis for the claim in his Senate testimony that SSDI was an “important factor” in the decline in labor force participation in the United States compared to other industrialized countries. In general, the only obvious conclusion to be drawn from comparing the United States to other countries is that disability benefits in Western Europe and most other advanced economies remain more generous, despite recent cutbacks. Around 6 percent of the working-age population in the United States receives disability benefits, the same as the OECD average. However, the United States spends less on benefits: 0.8 percent of GDP, compared to an OECD average of 1.1 percent. The major European economies (EU-15) spend even more (1.3 percent of GDP) (author’s analysis of OECD data). These figures don’t include other benefits received by disability beneficiaries, but a more inclusive measure is not likely to change the overall picture. As a result, the United States has the dubious distinction of having the highest disability poverty rate in the OECD. Though this partly reflects a higher overall poverty rate, the poverty rate for disabled Americans is high even relative to overall poverty in the United States. Next: Do Disability Trends Reflect a Liberalization of the Program’s Medical Criteria?